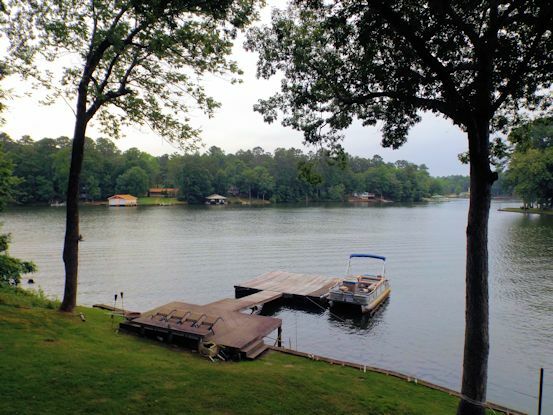 As mentioned in the last post, I was headed to my friend Terri’s lake house in Jackson, GA. 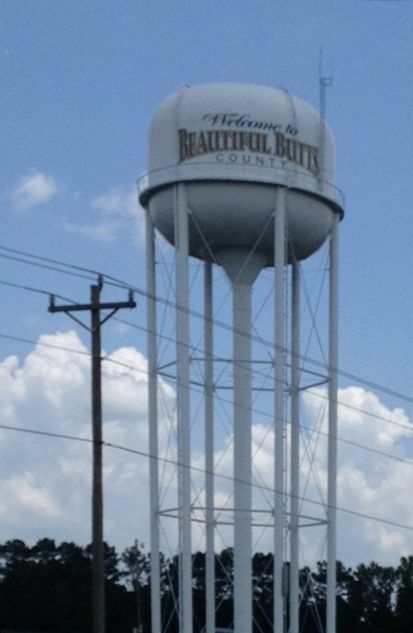 I felt an extreme sense of peace driving by the county landmark. Finally, someone appreciated my bountiful attributes. 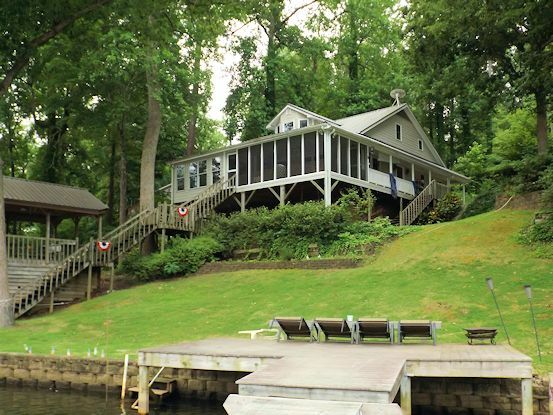 …and drove by my dream house. It’s for sale. 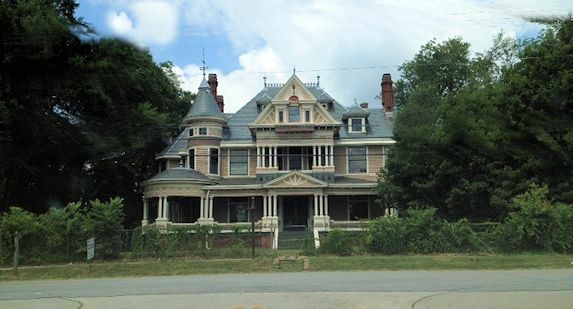 If a million people would just send me one dollar each, I could buy it and renovate it. One dollar isn’t asking too much, I don’t think. Finally, I arrived at Terri’s house where she doesn’t charge you a dollar for some birthday rest and relaxation. 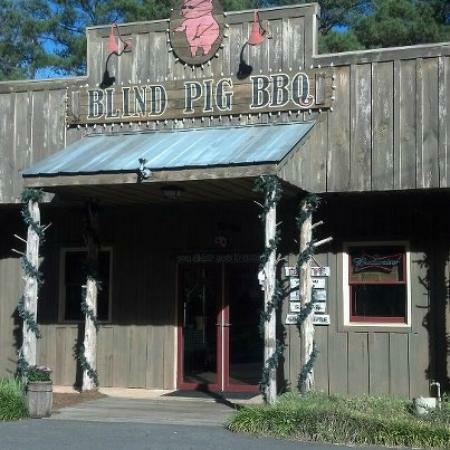 We chatted on the porch for a while and then headed over to the Blind Pig BBQ. Great meal in a fun setting. I saved some of the BBQ pork for my breakfast grits the next morning. 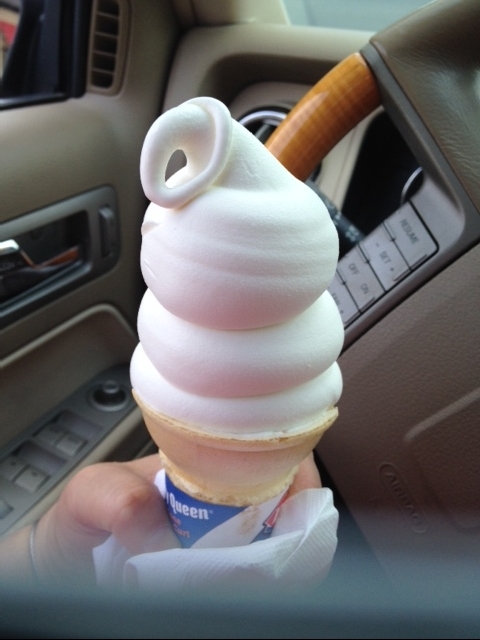 Great combo. 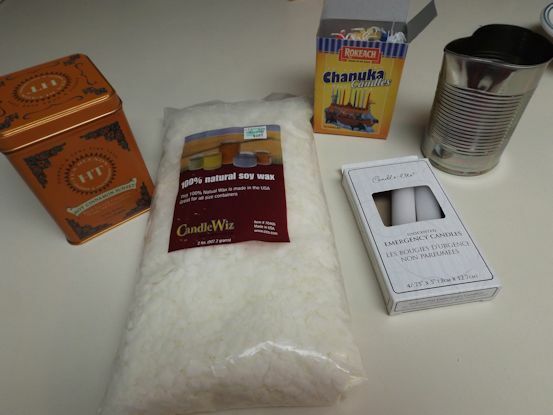 …and a candle-making session. I brought soy wax chips and some starter candles. 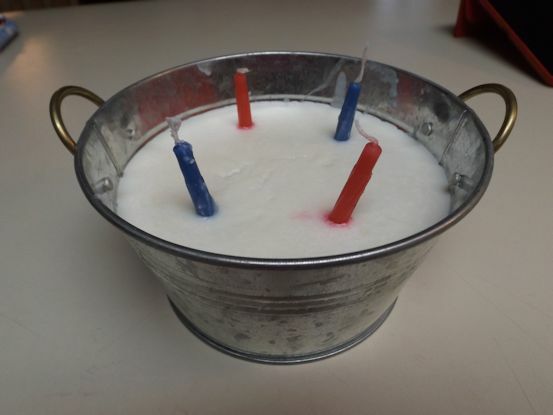 Originally, I planned for us to make candles in the tea tins, but Terri had empty bucket tins that looked great with our other Fourth of July decorations. 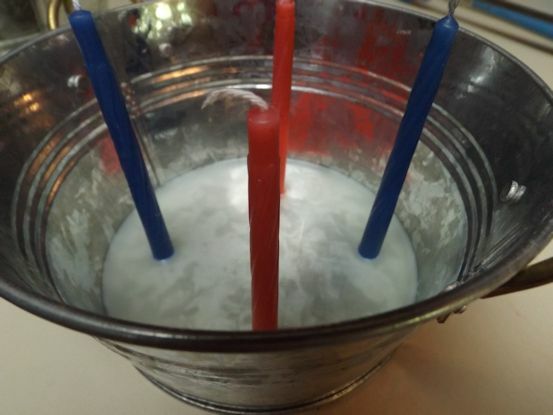 We melted the wax in a tin can placed in a saucepan of water – a double boiler of sorts. 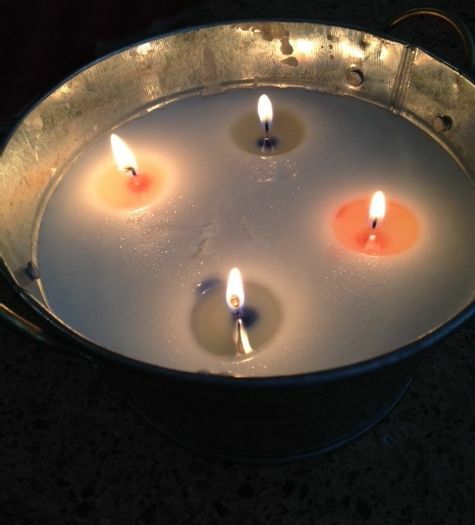 Then we poured a little wax into the tin and let it almost cool before setting the smaller candles. 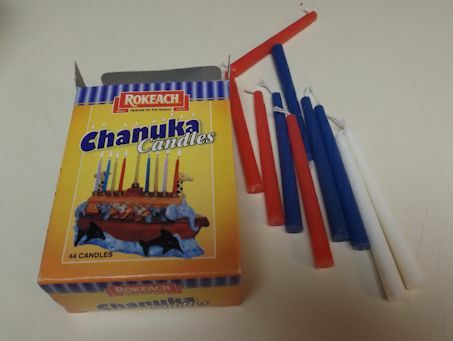 We used Hanukkah candles as the wicks because they are easy to stand up, cheap, and colorful. After several layers of wax, the candle started to fill. We had to hold up the candles if the wax was too hot. Finally the tub was full . I lit the candles and they burned down into this lovely puddle of colored wax. The candle has been burning for several hours with many more hours to come. 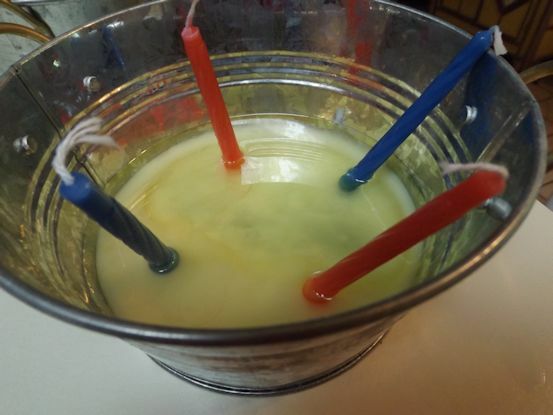 If you don’t want the color, use white candles for the wicks. …and rides on the jet skis. 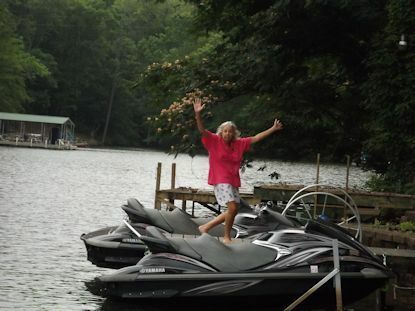 I give Terri a perfect 10 for her dismount and for her hostessing skills resulting in a wonderful time at the lake. 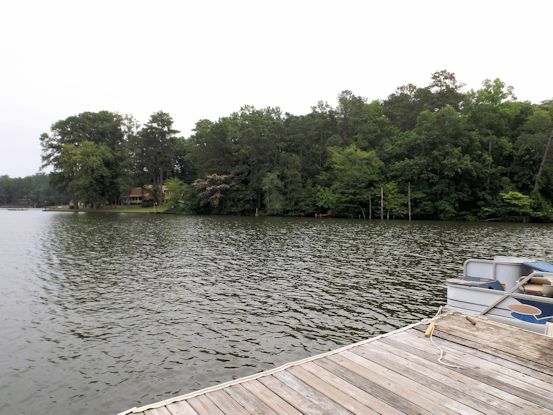 Julie, you are welcomed any time to Huller Lake House!! I hope you had the perfect Birthday weekend!! Fabulous girl time! I know you had the best birthday weekend!